Alongside Joanna Newsom, Devendra Banhart probably stands as the highest profile figure to have been lumped in with the dubious freak folk movement, but despite always being too popular, and too much of a personality to be embraced by the underground crowd he courts, he's been previously responsible for "Rejoicing In The Hands...", an album that's right up there with any contemporary hipster free folk jaunt. The old guard certainly seems to get on with him very well: Vashti Bunyan famously broke her thirty-odd year silence on Rejoicing, and for this record none other than Linda Perhacs provides a vocal. Since the release of Cripple Crow, Banhart has been tangled up on the celebrity circuit, hanging about with Lindsay Lohan and getting photographed by Karl Lagerfeld whilst all dressed up in Chanel haute couture. Heck, some of that spills over onto the album, with actor Gael Garcia Bernal lending his voice to opener 'Cristobal'. Regardless of all that, Banhart hasn't gone all commercial on us. Smokey Rolls Down Thunder Canyon is an album that strives for a rich, vintage sound, cutting out much of the top end definition and instead focussing on rich, muted analogue authenticity. That's not to say the music here is lo-fi as such, the production seems to take on a cast of thousands (well, tens at any rate) but ever since his Oh Me Oh My days Banhart has quite sensibly tempered his larger-than-life vocal presence with stylised recording techniques that fit with his more cartoonish tendencies. A sizable chunk of Smokey is sung in Spanish, which ties into the heavy Tropicalia influence that presides over much of the album. In fact, you could probably come to the conclusion that there are really two separate LPs on this disc (it's certainly long enough for that): one that taps into '70s Laurel Canyon style folk rock and another that takes its cues from the South American pop of Caetano Veloso. Both strains find considerable success: the clippety-clop shuffle of 'So Long Old Bean' is every bit as successful as the samba-fuelled psych pop of 'Carmencita', and there's an abundance of highlights: from the faux evangelism and gospel themes of 'Saved' to the idealistic, string-augmented 'Freely' and all out classic rocker 'Seahorse', which as of about five and a half minutes in switches from sounding a bit Doors-y to cranking out an absolute monster of a guitar riff, marking the moment when Banhart transforms himself from fanciful folk crooner into a textbook rock frontman, roughing up the mic. The album's shortcomings inevitably stem from its excessive duration. The superfluous dub calamity 'The Other Woman' is more of a B-side than an album track, while the brassy boogie-woogie of 'Lover' is a comical enough diversion but doesn't quite fit into the bigger picture. Further to all this, Banhart's bète noir rears its head on 'Shabop Shalom': his tendency toward outright whimsy and downright daftness prevails, and although there is something fairly amusing about him addressing a girl as "My sweet Tel Avivian lambsbread", it detracts from the overall record. That said, a few lines later he comes up with "So happy it makes me when she asks who wrote the Book of Job / She asks who wrote the Dead Sea Scrolls / I did. Yes. I did." 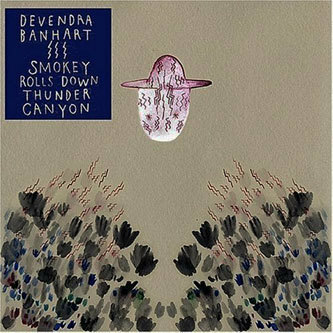 and you can't help but chuckle along with him, which is pretty typical of Banhart's form on Smokey Rolls Down Thunder Canyon: regardless of a few continuity errors and a bit of excess baggage, you'll always find something to love about this album. 2LP + CD + 7"